beoutQ Piracy : Who is behind beoutQ ? Like all pirates, the beoutQ operators don’t have the courage to operate in the open. 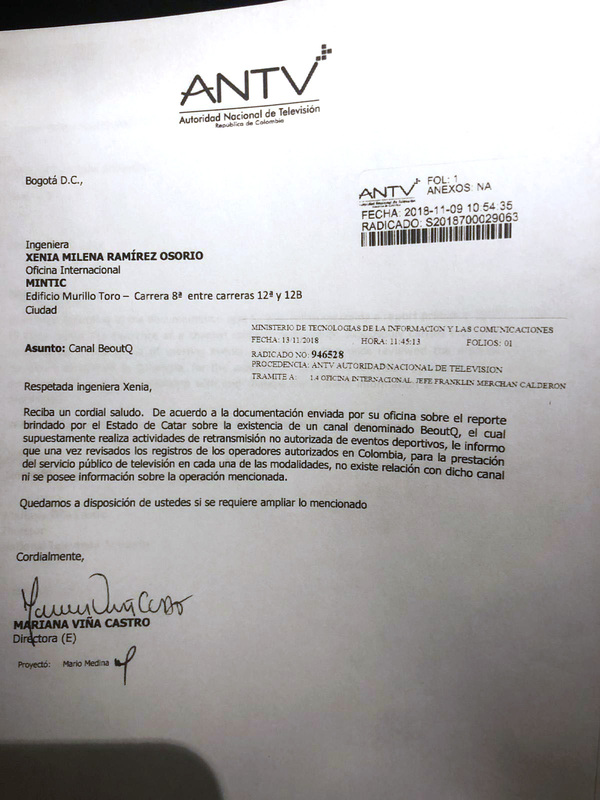 They have made bogus claims on their website about being based in Cuba and Colombia, and even broadcast childish “Welcome to Cuba” and “Welcome to Colombia” clips on their channels to try to con the world into thinking that they are based in the Americas. 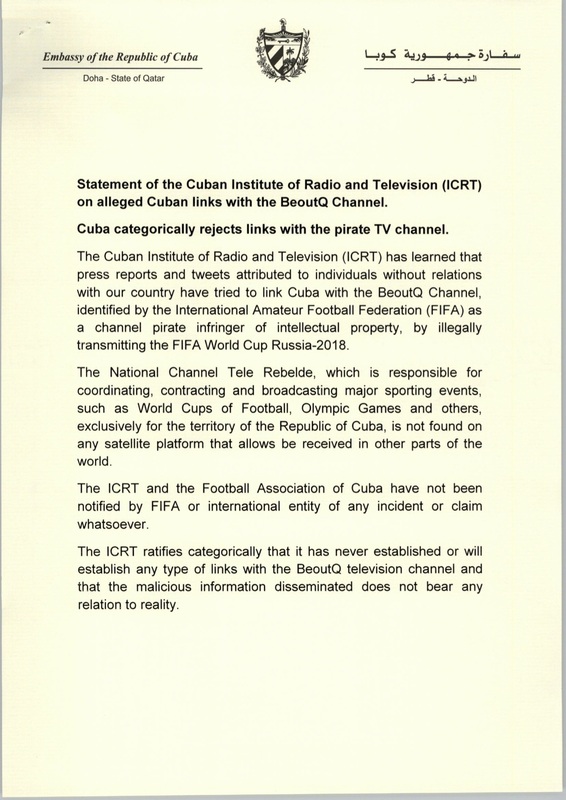 The nonsense of beoutQ’s claims did not go unchecked, with authorities in both Cuba and Colombia writing letters (below) to firmly refute any and all claims that the pirate operation is connected to them. 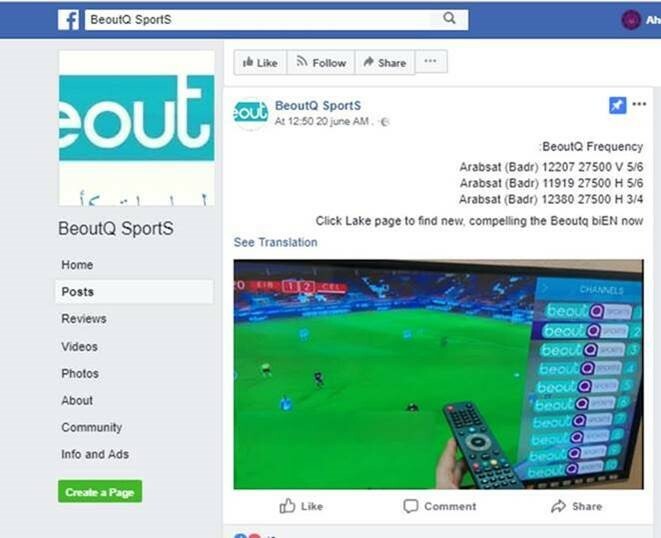 There is overwhelming evidence placing beoutQ firmly in Saudi Arabia, including the fact that the beoutq.se website is geo-blocked to Saudi Arabia and satellite subscriptions must be validated from a Saudi IP address; its subscriptions are priced in Saudi riyals only; and its channels carry advertising for numerous Saudi brands. 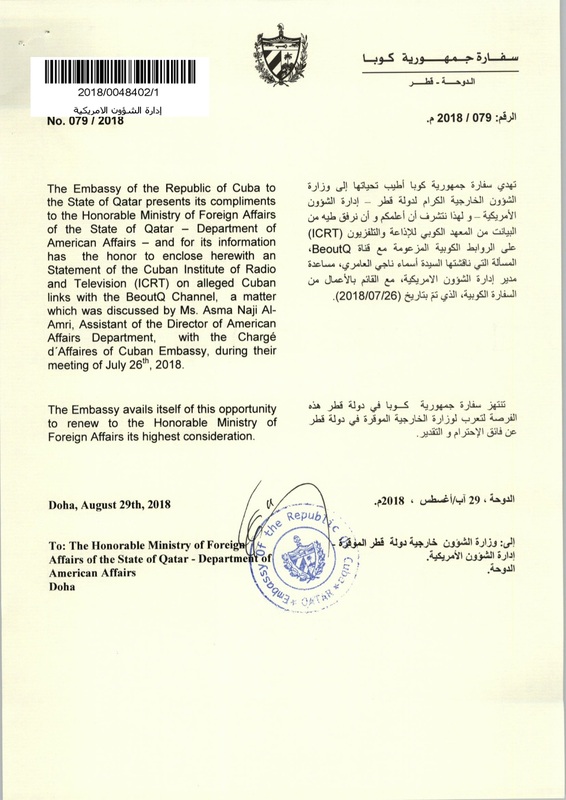 Indeed, even the name “beoutQ” is manifestly intended to mean “be out Qatar” – a reference to the Saudi-led blockade against Qatar. 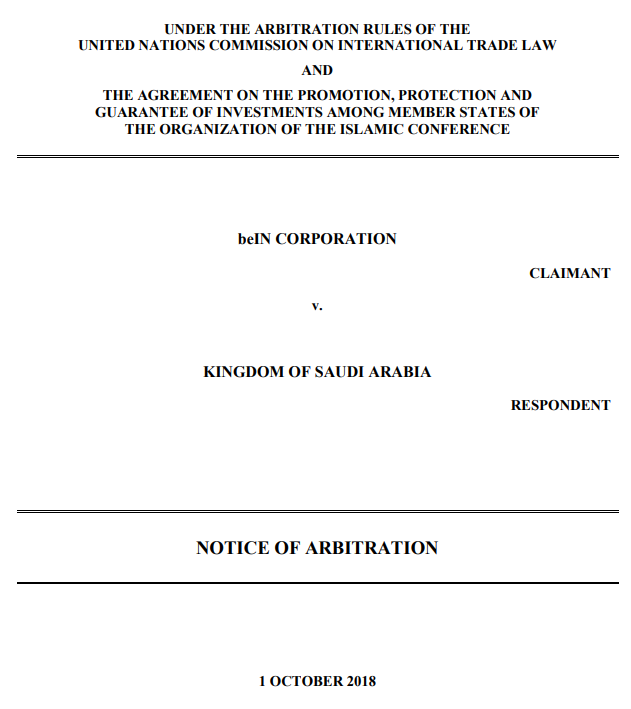 Such is the extent of beoutQ’s theft of intellectual property rights that on 1 October 2018 beIN launched an international investment arbitration against Saudi Arabia claiming +$1 billion in damages – click on the image below for the full legal evidence against Saudi Arabia filed in the arbitration. This led The World Trade Organization (WTO) to approve a request by the State of Qatar for the establishment of a WTO panel to adjudicate on the case brought against the Kingdom of Saudi Arabia (KSA) for violating the intellectual property (IP) rights of Qatari citizens and companies. The decision was taken during a session of the Dispute Settlement Body (“DSB”), which took place on December 18, 2018 in Geneva. The complaint highlighted the various infringements and violations committed by KSA against the IP rights of Qatari citizens and companies - including the rights of television broadcasters - and the piracy committed against beIN Media Group LLC. Additionally, the complaint outlined KSA’s violation of its obligations to provide protection for IP rights holders under international treaties, as the Saudi authorities have prevented Qatari citizens and entities from exercising their most basic rights before law enforcement authorities in KSA., in order to protect and defend their IP rights. Investigations and legal actions have also revealed the identity of some of the operators. A subpoena issued to a third party company based in the United States, whose services were being used to operate the beoutQ website, revealed that its services had been purchased by Dr Raed Khusheim. A sworn affidavit has been provided confirming that the services purchased by Dr Khusheim were used to operate the beoutQ website [link to affidavit]. Dr Khusheim is the CEO of the Saudi company, Selevision – which operates the Seevi television service. It is also known that beoutQ is broadcast using satellites operated by Arabsat, a large regional satellite operator headquartered in Riyadh and whose largest shareholder is the Government of Saudi Arabia. Expert reports prepared by third party companies [link to NAGRA report] have confirmed that beoutQ is broadcast on Arabsat, and have also provided further evidence of the involvement of Selevision. 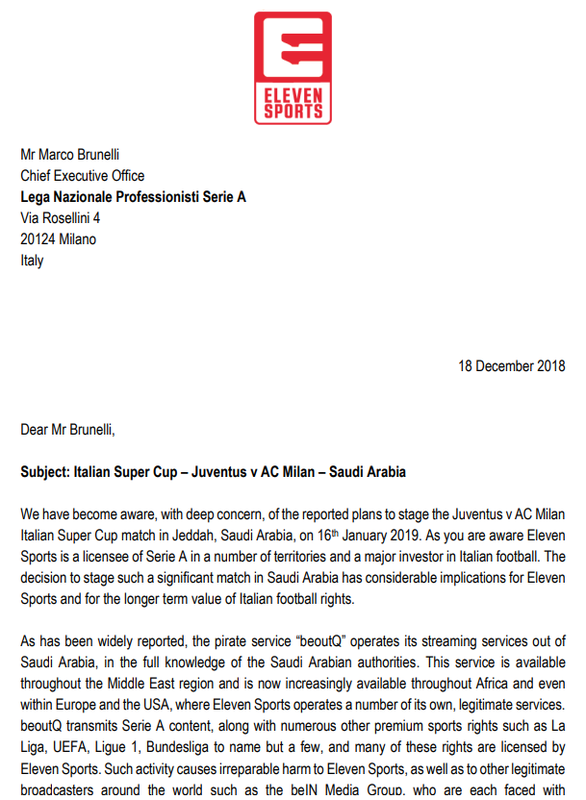 beIN, and many others, have written to Arabsat, requesting that it takes down the channels [link to letter]. However, Arabsat has refused to take the channels down, and asked for more evidence. 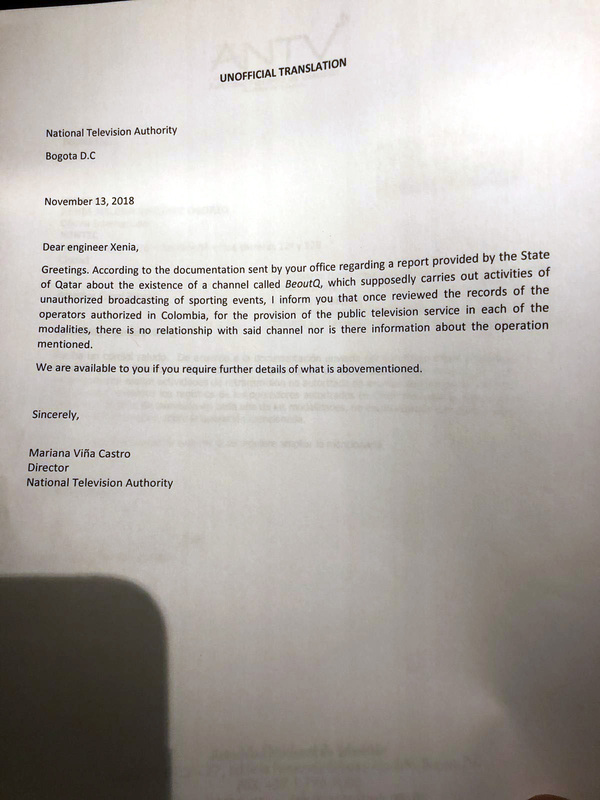 When beIN provided that evidence, it still refused to take the channels down, and started referring all letters to a law firm in the United States. It is still trying to deny that it is broadcasting beoutQ. But even beoutQ said it is using Arabsat satellites.